CTB1 is a nearby supernova remnant (SNR) with an apparent diameter of about a half a degree (about the same size as a Full Moon). Upon early discovery, CTB1 was thought to be a planetary nebula, so Abell included it in his catalog of planetary nebulae as Abell 85. Further research showed that CTB1 is, in fact, a supernova remnant. The deep red color of the SNR comes from light emitted by energized Hydrogen (Ha), but CTB1 also has an area shining in blue/green light from energized Oxygen (OIII) atoms. The surrounding Ha light has been shown to be related to CTB1 as well. CTB1 makes for a very challenging object to photograph, as it is quite faint. 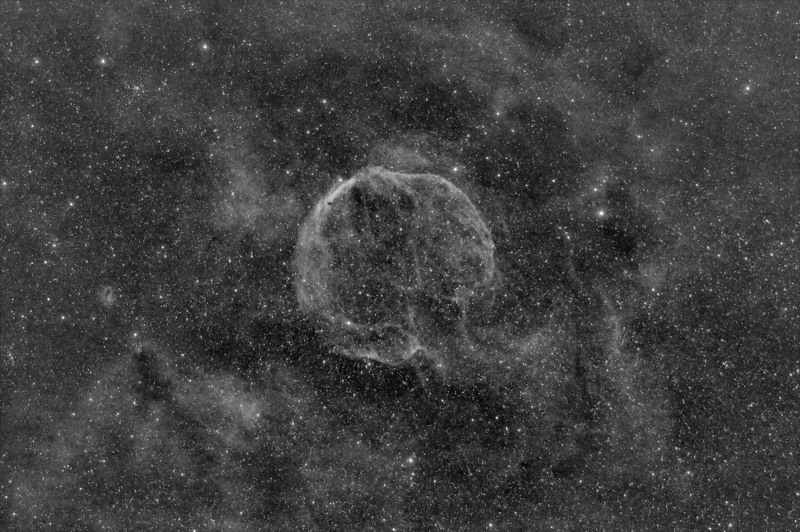 This image was captured using an Ha filter to show the hydrogen gas throughout the field of view. I also have a Full Color HaOIIIRGB version of this image. In this image, North is down. This image was cropped to 68% of the original frame. Software Used Images Plus 5.75 for camera control, calibration, and stacking. Images Plus 6.0.5 for DDP stretching, star size reduction, smoothing and noise reduction, and frequency filter. Photoshop CS5 used for levels and curves, screen mask invert, and high pass filter. Gradient Xterminator for gradient removal. Carboni Tools for additional noise reduction and smoothing. Registar 64 for subexposure alignment. Notes CTB1 is a fascinating target and proved to be a nice challenge. This is the Ha only version of the HaOIIIRGB image.